Katie speaks from a mind that is clear; working with a system that enables one to disengage from attachments of the mind, that trick us into believing that whatever we think is true. Katie presents an understanding that helps one find release from this incessant clinging that causes us pain. Suggesting that if we believe in what we think, then we are “carried off” by the “endless dramas” of our self. Dramas of the ego, striving to protect or defend or aggrandise itself. Habitual thoughts that we carry, as we avoid experiencing that which is beneath our addictions, or simply because we have become the re-actions, when similar stimulus is encountered, yet again and again and again. Our preferences creating “who” we are. What we like or dislike, prefer, or see as plain “wrong.” So many scenarios that exist because we have opinions about things and cling to these opinions as if our very existence depended on it. Byron Katie sees the mind’s “natural condition” as peace. A peace where we are at one with the world. Then “a thought enters” and once we believe it, the peace seems to disappear. This sense of peace may be experienced in the practice of meditation, when one allows the mind to settle, and all of its busyness becomes stilled. It is at this point where awareness of ‘what is,’ becomes ‘present’ again. Not always easy, but very worthwhile. According to Katie, we “become the stories” that we tell our self. (120) We become a storyteller who ends up believing the stories we tell, where we become those very stories, whether we like the feeling of them or not. Katie reminds us that we are “what lives prior to” these stories, (120) before the mind becomes entangled. Katie’s process called “The Work” involves four questions and a turnaround. A simple process in practice, but quite profound in effect. She suggests that if you can question what you believe, it is then that you will begin to see clearly. To go beyond the beliefs that are lodged in the unconscious mind. 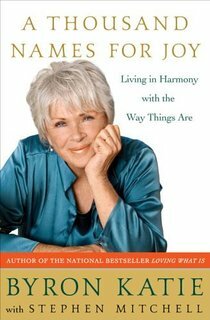 * All quotes refer to Byron Katie’s book “A Thousand Names for Joy: how to live in harmony with the way things are.” Link for contact with Byron Katie’s work.